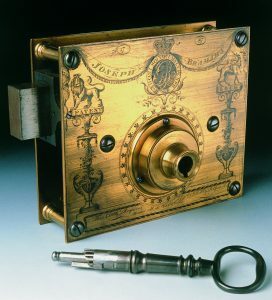 The first high-security lock was called the Bramah lock, named after its creator, Joseph Bramah. It was designed in 1784. He also created the Bramah Locks Company the same year, which is still around today. It took 67 years for someone to rise to the challenge -in the end it was American locksmith Alfred Charles Hobbs. Although the circumstances around the opening were initially met with some argument, he was eventually rewarded the prize. It took him 51 hours over a 16 day period. The design for the Bramah lock utilised a cylindrical key. It is similar to modern day tubular pin tumbler locks, but it uses fixed wafers rather than two-part pins. The Bramah lock had 18 wafers, meaning it had four hundred and seventy different combinations. Since the invention of locks there have been locksmiths, there to solve the inevitable problems associated with locks. As technology continues to evolve, so will we at Out & About Locksmiths – we’ll always be there to unlock, repair, replace, fabricate, re-key, or whatever it is you need. Need a Locksmith? What is a Transponder Key?